This symbol represents the best bless of wedding and marriage, the word was found in Tang Dynasty. 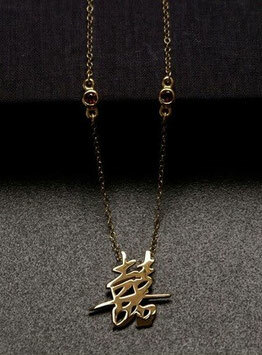 The Double happiness was beautifully hand painted by Kewei’s Grandfather who has been in marriage for more than 70 years and he spent most his life painting calligraphy, this Gold necklace is the best gift for those who are newly married or who are celebrating the wedding anniversary. Solid 18ct yellow gold pendant, 4.8g in weight, attached to an 18ct gold chain (2g) with two garnet settings. The red of the garnets compliments the gold beautifully, and is strongly associated with love, energy and passion in China. 18ct yellow gold pendant with 18ct gold chain and garnets.